I am sure most of you have seen the infomercials for the Fein MultiMaster over the past few years. Their tool does everything: it slices, it dices, cuts tile, drywall, etc. But it also comes with a pretty big price tag. You are looking to spend around $200 for the tool, and attachments are around $60. Good thing for all of us, patents expire. Toolsnob also has news of a Dremel version . The Dremel Multi-Max will retail for around $100, with accessories costing between $4- $40. It will be available in the US :) I am sure you can expect an overwhelming amount of attachments, and accessories to go with it. Amazon has a sneak peek of the new Bosch Cordless PS50-2A 12-Volt Max Multi-X. It is the same as the above tools, but in a cordless version that uses the same battery as other Bosch 10.8/12V Litheon tools, like the ones in our Bosch Impactor Giveaway. This is the one that really has me excited. 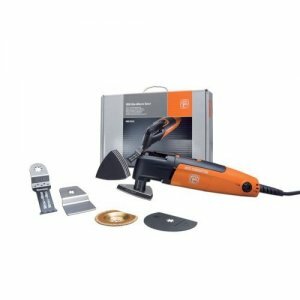 It will also use both Bosch, and Fein accessories. Amazon has it listed for $200, but I would hope the price would come down in a relatively short amount of time. $200 is still to much for me. I am sure you can expect high quality from all 3 brands.